The internet is rife with different claims to and versions of the dish called Oysters Kirkpatrick. Most involve oysters, bacon, tomato ketchup and a sprinkling of cheese. The Palace Hotel in San Francisco has a strong claim to the recipe dating from the late 1890’s. Oysters Kirkpatrick in The Hotel St. Francis Cook Book (pub.1916) informs us the dish is made of oysters on the half shell seasoned with salt, pepper, Worcestershire sauce, tomato ketchup, grated cheese and a dab of butter on top. Bake for 5 minutes. I met Oysters Kirkpatrick during the 1980’s at Spenger’s Fresh Fish Grotto (opened 1890, 4th street Berkeley). Their version was heavy with cocktail sauce and thick cut bacon, the oyster hardly noticeable. My recipe aims to highlight the oysters by using a lighter, tangy homemade cocktail sauce and thin pancetta instead of bacon. Drain the oysters from their juice and wrap individually using one pancetta slice per oyster. Mix the cocktail sauce ingredients and taste for salt and pepper. The oysters will exude some liquid as they cook, thinning and adding their distinctive flavor to the sauce. 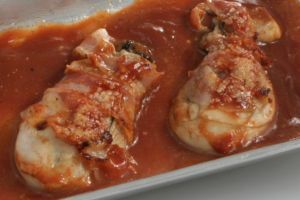 Use all but a few spoonfuls of the sauce to cover the bottom of a small ovenproof pan or in the bottom half shells of the oysters. Place the oysters on the sauce and broil on the highest level of the oven for 5 minutes or until the pancetta begins to brown and crisp. Use the remaining sauce to thinly coat the top of each oyster and sprinkle with a pinch of Parmesan. Run under the broil about 1 minute, just to glaze the oysters. Serve in the casserole (or half shell) with French bread for the sauce.